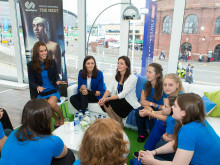 The Duchess of Cambridge’s work with aspiring athletes was praised by some of the biggest names in British sport today at a SportsAid reception she attended during her visit to the Glasgow 2014 Commonwealth Games. SportsAid's Patron is today meeting some of the rising stars of British sport at a reception hosted by the charity in Glasgow. The young SportsAid athletes will be mentored by Laura Robson, Keri-anne Payne, Aled Davies and Steve Parry. SportsAid athletes say "I will be next"